So, what makes it so different?! Why does this shade of wintery goodness feel like a deep drink of a chai latte or a bite of a warm snickerdoodle? I am convinced that it is the pieces paired with the wall color that make it is so striking... and, dare I say, Brilliant? The modern lighting, furniture, and stacks of books and the plant make it really stand out and, as an American, I personally love seeing our traditional colors in a Swedish home that would typically have white walls. What do you think? Isn't it just the room to cozy into during the cold winter months? 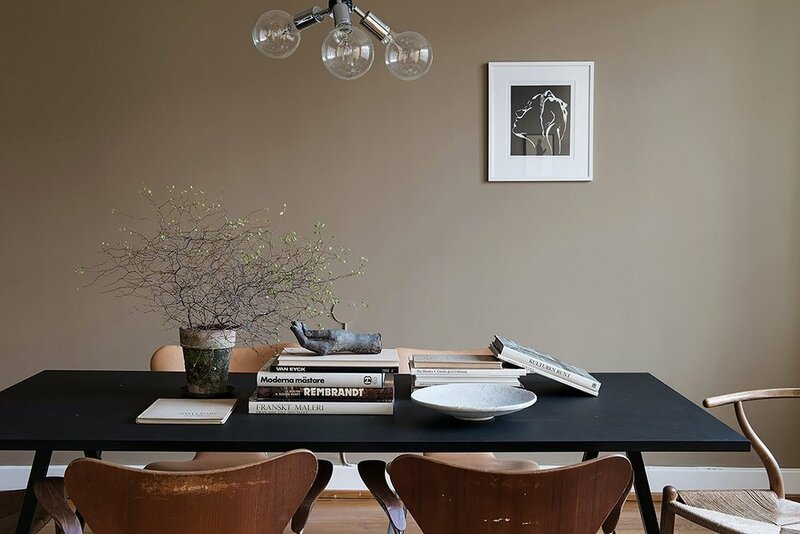 To get the look try using a modern table, like the Hay Loop Table, Authentic Wishbone chairs (or these that are similar in style), Arne Jacobsen 7 series chairs, Artful books, a handmade Bowl, Wood Cart, and a modern chandelier. For these photos and to see more of this lovely home, visit Alvhem. Winter Bedroom Completed with Video Tour + DIY's!